To view the Dachshund breed standard visit American Kennel Club. 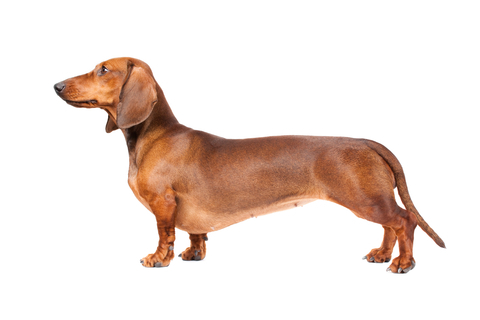 general appearance and dachshund breed standard colors. The dachshund has a long body, low to the ground with short legs. Has a robust muscular build with elastic, pliable skin with no excessive wrinkling. His movement appears neither awkward or cramped, with bold well-balanced confident head carriage, alert intelligent facial expression. 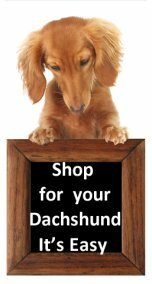 Dachshunds are bred and shown in two sizes, standard and miniature, miniatures are not a separate Classification, but compete in a class division for “11 pounds and under at 12 months of age and older.” Weight of the standard size is usually between 16 and 32 pounds. With medium sized eyes, almond shaped with dark rims, pleasant, energetic expression, not piercing, very dark in color. The ears are set near the top of the head, of moderate length rounded, not narrow pointed or folded. The skull is slightly arched, not too broad or too narrow. With a long muscular neck, clean cut, without dewlap, slightly arched in the nape, gracefully flowing into the shoulders. Long,fully muscled trunk. The back should lie in the straightest possible line between the withers and the short, very slightly arched loin. The front should be strong, deep, long and cleanly muscled. The breast bone should be very prominent. Front paws are full, tight and compact, with well arched toes and tough thick pads. Well muscled, and strong. The pelvis, thigh, second thigh, and the rear pastern are ideally the same length and give the appearance of a series of right angles. The tail is set in continuation of the spin, without kinks or twists and not carried too gaily. Gait will be fluid and smooth, The forelegs reach well forward, without much lift, in unison with the driving action of the hind legs. Short, choppy movement, rolling or high-stepping gait, close or overly wide coming or going are incorrect. This little dog is clever, lively and courageous to the point of rashness, preserving in above and below ground work, with well developed senses. The Dachshund dog is bred with three varieties of coat. 1. Smooth; 2. Wire haired; 3. Long haired - are shown in two sizes, standard and miniature. As referred to AKC Dachshund breed standard. Coat should be smooth and shining neither, too long or too thick. The coat with the exception of the jaw, eyebrows and ears, the whole body is covered with a uniform tight, short, thick, rough, outer coat but with finer, softer, shorter hairs (undercoat) everywhere between the course hairs. The distinctive facial furnishings include a beard and eyebrows. Dappled dachshunds is a pattern, shown as lighter colored areas contrasting with the darker base color, which may be any acceptable color. Piebald,Brindle and Sable Patterns - firstly piebald is a common pattern that appears in all coat varieties, a brindle is a pattern and not a color, in which black or dark stripes occur over the entire body. Sable this pattern consists of uniform dark overlay on red dogs. The tip of each hair is much darker than the base color. One colored dachshunds include red and cream, with or without shading of interspersed dark hairs. Two colored dachshunds include black, chocolate, wild boar, gray (blue) and fawn (Isabella). Wild boar appears as bands of the individual hairs and imparts an overall grizzled effect which is most often seen in wire haired dachshunds, but may appear on other coats. Color variations include red boar and chocolate and tan boar, tan points may be sometimes evident. This is an overview of the Dachshund breed standard and dachshund dog characteristics. American Kennel Club - Dachshund breed standard.